All these awesome Rotty Pups are already following us everywhere at 4 weeks of age. They hear your voice and they come running. Climbing all over us, such sweet babies. Born ~ December 14th. Ready to go Home February 8th. 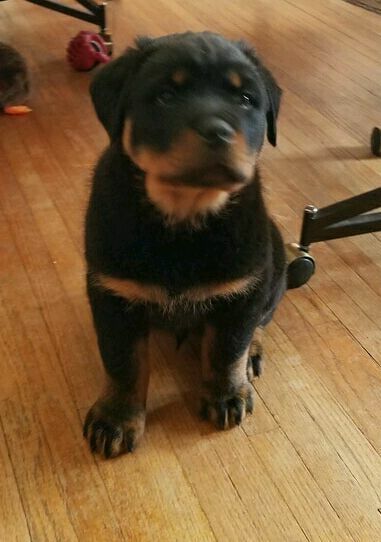 AKC Male Rottweiler Puppy. Purple boy is curious, He's a little explorer. He loves to be the first one to you. He's a chunk, big boned, and beautiful. SOLD. AKC Male Rottweiler Puppy. Light Blue Boy loves my daughter, he's a cuddle bug. One big boned boy. He's also quite the explorer. SOLD. Born ~ December14th. Ready to go Home February 8th. AKC Male Rottweiler Puppy. Brown Boy, can I say hubba hubba, what a champ. Big boned, solid, and such a sweet heart. Sold. Each puppy is loved and is handled from birth. We start POTTY training @ 3 weeks, plus crate training @ 4 weeks. Plus when we start feeding the moist baby food @ 2 1/2 weeks old, we do it one at a time, this makes them neat eaters. We live on a farm, so our pups are socialized daily & will be use to cat's, other dogs, chickens, peacocks, turkeys, guineas, geese, and children, loud noises, just to name a few. Our puppies come with ~ two sets of shots & deworming records, AKC papers, Micro-chipped, a toy that has been with them since they where 3 weeks old, health records from our vet, a NuVet sample, an AKC puppy handbook, a free sample of NexGard, plus a goody bag to help you get started with your little Puppy. You will also have our support for the lifetime of your Puppy. Dewclaws are removed and tails are docked in the first few days of birth by our vet.